What's coming next from Rather Dashing Games! Next week we’re headed to Gen Con to debut our newest release, We Come in Peace. We can’t wait to show everyone what we’ve been working on for so long. But as exciting as that is, we have a whole slate of new games on their way to you in the coming months. So here’s a sneak peek, but it’s not a secret! Tell your friends and start planning your game nights. you’re going to enjoy this challenging strategy game. The elements – fire, water, earth and wind – combined with the ability to have two to four players ensure that no two games play the same. Understanding the subtle yet powerful nature of the four elements is critical to surrounding your opponent and claiming victory. Each element has unique properties players use to block an opponent’s movement. Feed walls of flames, move raging rivers, raise impenetrable mountain ranges and even bend wind to your command. Look for this one in December! Journey back to the golden age of archaeology in the third installment of the Drawn & Quartered series of easy-to-learn, but hard-to-win games! This Belongs in a Museum builds on the tried and true mechanics of its two successful predecessors Pirates Ninjas, Robots & Zombies and Graveyards, Ghosts & Haunted Houses. 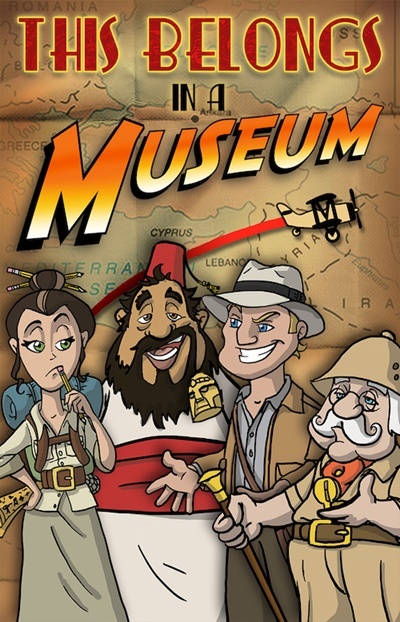 Like those games, This Belongs in a Museum is a dynamic strategic tile-laying game where you play as an archaeologist attempting to create high scoring dig sites and collect valuable artifacts before your opponents do. Use trucks, ships and airplanes to connect your dig sites to your encampment and move your archaeologist around the play area. Watch out for the mummy and its point-stealing powers! With a little luck and a lot of strategy, you may be the most daring archaeologist of them all. This Belongs in a Museum will be out in early 2017. Sure, we all know that pirates and ninjas don’t get along. But where does a Ninja Pirate fall in that spectrum? Or a Zombie Robot? Or a Robot Ninja? Only you can answer that question in Strange Alliances, our expansion for the hit game Pirates, Ninjas, Robots & Zombies! The expansion pack will be available in early 2017. Stay tuned for our emails and updates to make sure you don’t miss any of the fun! Enjoy this little tease featuring Element, our easy-to-learn but deeply strategic game of capture and area control. We can’t wait for you to play it later this year! Boardgame Corner loves We Come in Peace! Mark Streed and Randy White at Boardgame Corner reviewed We Come in Peace and had some awesome things to say, calling our newest game “a great conversation game, people are laughing, having a good time” and “a great way to kick off a game night.” Now that’s good stuff! And we love Randy’s comment: “There’s five other players I can do dastardly things to.” Sounds like someone who really gets We Come in Peace! So that’s a little taste, but to get the full picture, you’ll want to see the video! And to add to it, Mark gives us another shout-out in The Dice Tower Week in Review. Remember, We Come in Peace with its special bonus game piece is available for pre-order right now! Get yours before the bonus pieces are all gone. We Come in Peace aliens revealed! One by one we’re telling the stories of the aliens from our soon-to-be-released game, We Come in Peace. If you haven’t met them yet, you’ll find that each one has their own…um…interesting background. You won’t want to miss these! Check out our Videos page to see who we have so far — and there are two more to come! You can pre-order We Come in Peace now to receive a special bonus promo core too! This is a limited offer, so be sure to order right away.